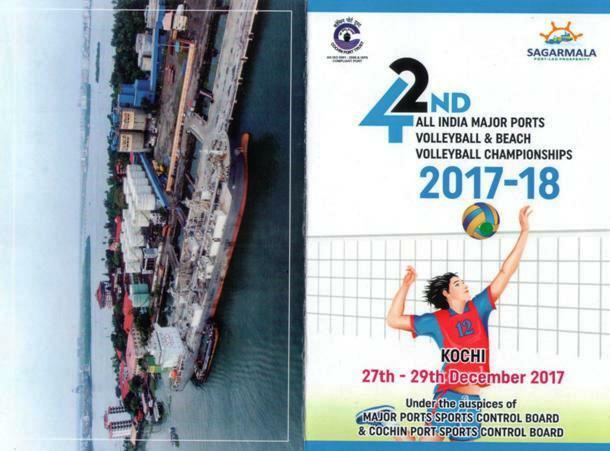 The 42nd All India Major Port’s Volleyball & Beach Volleyball Championships will commence on 27 December 2017 at Cochin Port Volleyball ground. According to a media statement, about 100 players from eight Major Ports viz. Mumbai, (VOC) Tuticorin, Paradip, Chennai, Kolkata, Vishakhapatnam, Mormugao and Cochin will be participating in the championship. The event will be inaugurated on 27 December 2017 at 05.15 PM at the South End Recreation Ground, Willingdon Island. Valedictory function will be held on 29 December 2017 and prizes will be distributed by Mr A.V. Ramana, Deputy Chairman, Cochin Port Trust. Cochin Port Trust is the reigning champions in both Volleyball and Beach Volleyball.